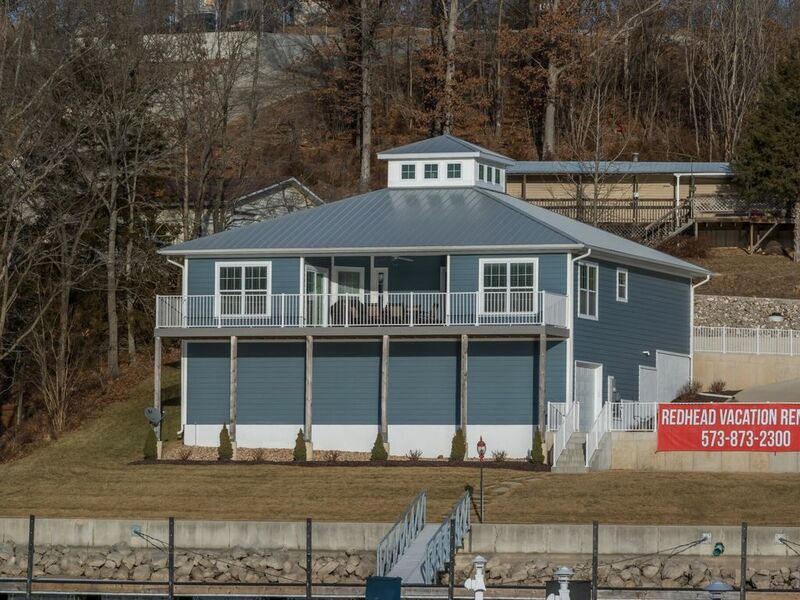 Redhead Yacht Clubs ultimate lakefront homes are located in Osage Beach on the 21mm by land off KK and Three Seasons, 3 bedrooms, 2 bathrooms, and 1,800 sq ft of living with lakefront access! Luxurious master suite, panoramic lake views, and spa-like master bath. Two additional king sized rooms with a queen sleeper sofa in living room. Home sleeps up to 12 comfortably (1-Master Bedroom, 2-Bedrooms w/King bed and bunk beds, 1 Living room Pullout). These homes are the ultimate vacation getaway for families or groups. These homes have a beautifully appointed kitchen with granite, washer and dryer, custom tile and high end appliances. Stunning outdoor dining areas, gas grills included with a 44ft deck for lounging and entertaining. Massive courtesy dock is included for boat parking for you and your guests. A golf cart with personal garage is included for each unit, for easy accessibility to redhead lakeside grill. Start up supplies are provided for ONLY the first day (Toilet paper, Laundry Detergent, Dishwasher Detergent, etc. ), after what is provided is used, it is then up to you to supply those things for the rest of your stay. It was a pleasure having you! Hope to see you again! Absolutely love this place, Chy is amazing to work with ! This property has a great view and amazing location. We have stayed here on several occasions and we will definately be back!! Thank you, Heather!! It is always a pleasure having you!! Looking forward to seeing you again! Perfect spot for a little getaway! The house is beautiful and spacious. It is very nice and spacious 3bhk property. Clean and nicely maintained. Lake view from balcony is amazing. We stayed there on weekend with 3 couples and 2 kid.